The team of Juri and Julia is an odd pairing, but in Street Fighter x Tekken 2013, it works. Roknin's got the proof inside. 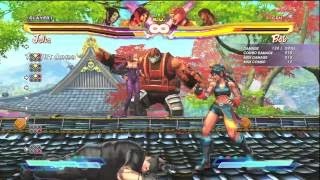 Roknin has posted some unused combos featuring Juri and Julia working as a team in Street Fighter x Tekken 2013. These combos were rediscovered when the uploader was attempting to make a YouTube channel intro. The clip is titled, "SFxT Leftovers 01."